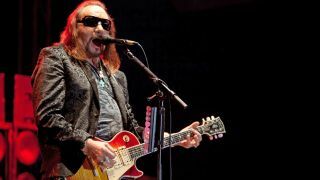 Former Kiss guitarist Ace Frehley has started work on making a covers album – and he’s invited Slash, Lita Ford and Pearl Jam’s Mike McCready to make guest appearances. He’s hoping the covers record will appear next year. Meanwhile, he describes Space Invader as something of a departure from 2009’s Anomaly. “It’s heavier – I did it by design,” Frehley reports. “My fans said my last album could have been heavier, and could have had more guitar work, so I kept that in mind. The biggest surprise is the title track – that was instrumental until we were mixing it. I went to my hotel and wrote lyrics and melody, and through it together in one day. Meanwhile, Classic Rock will release Slash’s third solo album World On Fire as a Fanpack on September 15 – a full four weeks ahead of its regular release date.